1.1 This protocol provides guidance for locating local origins for data collection on bridge elements other than the deck, deck overlay, or approach slabs. 1.2 Descriptions, sketches, and/or photographs of the local element origins. 2.1.4 Pen, sketch pad, and clipboard. 3.1 Identify the origin of the rectangular local coordinate system and the data collection grid for the deck (FLD-OP-SC-001, Data Collection Grid and Coordinate System for Bridge Decks). 3.2 Segment the bridge, the superstructure, and substructure into individual elements such as girders, abutments, bearings, etc. Identify each element with a unique element identifier (FLD‑OP‑SC‑002, Structure Segmentation and Element Identification System). 3.3.1 X – Longitudinal along the bridge. 3.3.2 Y – Transverse to the direction of travel. 3.4.1 Girders: Establish the local origin for girders at the end of the girder nearest to the deck origin in the “X” direction, as shown in figures 1 through 4. Figure 1. Illustration. Location of Local Element Origin and Defect Coordinates on Steel I-Beam – Isometric View. Figure 2. Illustration. Location of local element origin and defect coordinates on steel I-beam—elevation view. Figure 3. Illustration. 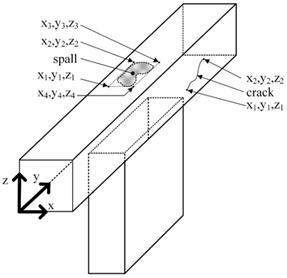 Location of Local Element Origin and Defect Coordinates on Concrete I-Beam – Isometric View. Figure 4. Illustration. Location of Local Element Origin and Defect Coordinates on Concrete I-Beam – Elevation View. 3.4.2 Diaphragms: Establish the local origin for the diaphragms at the point nearest to the deck origin in the “Y” direction and at the lowest point possible on the diaphragm in the “Z” direction. When locating defects on the diaphragm, ignore the effects of skew on the x-coordinate. 3.4.3 Secondary members: Establish the local origin for all secondary members following the same scheme as the diaphragms. If the members are in plane with the deck, then the y- and x- coordinates of the local origin will be closest to the deck origin as possible. 3.4.4 Girder bays: Establish the local origin for girder bays (stay-in-place forms, or exposed deck undersides) at a point on the underside of the forms or the exposed deck nearest to the deck origin in the “X” and “Y” directions. 3.4.5 Overhangs: Establish the local origin for overhangs at a point on the underside of the nearest to the deck origin in the “X” and “Y” directions. 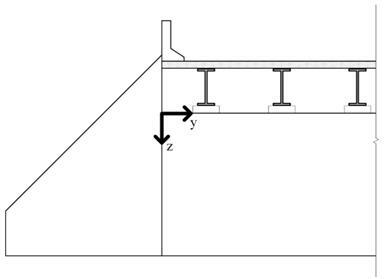 3.4.6 Abutments: Establish the local origin for abutment A on the top of the abutment cap at the point closest to the deck origin in the “X” and “Y” directions (figure 5). Establish the local origin for abutment B on the top of the abutment cap at the point farthest from the deck origin in the “X” and “Y” directions. Figure 5. Illustration. Location of local element origin on abutment stem. 3.4.7 Pier caps: Establish the local origin for pier caps at the bottom corner closest to the deck origin in the “X” and “Y” directions. Locate defects by using the two directions that are in the plane of each face of the pier cap or pier. For example, defects on the top of the pier cap will be located in global “X” and “Y” directions, with the “Z” coordinate value remaining constant regardless of skew or super elevations. Figures 6 through 9 illustrate the location of the origin on typical pier elements. Figure 6. Illustration. Location of Local Element Origin and Defect Coordinates on Pier Cap with Square End – Isometric View. Figure 7. Illustration. Location of local element origin and defect coordinates on pier cap with square end—plan view. Figure 8. Illustration. Location of Local Element Origin and Defect on Pier Cap with Rounded End – Isometric View. Figure 9. Illustration. Location of Local Element Origin and Defect Coordinates on Pier Cap with Rounded End – Plan View. 3.4.8 Rectangular pier columns: Establish the local origin for rectangular pier columns at the top corner of the exposed length of the column closest to the deck origin in all three directions (figure10). Figure 10. Illustration. Location of Local Element Origin and Defect Coordinates on Square Pier Column – Isometric View. 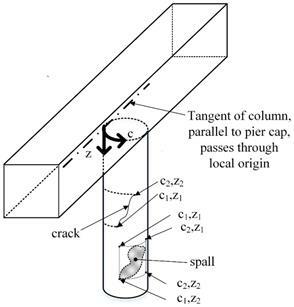 3.4.9 Round pier columns: Establish the local element origin for round columns at the top of the exposed length of the column at the intersection of the circumference of the column and a tangential line parallel to the transverse direction of the cap. The local origin is defined as (0,0) for two dimensions: “z,” vertical on the column face; and “c,” around the circumference of the column (figure 11). Figure 11. Illustration. Location of Local Element Origin and Defect Coordinates on Round Pier Column – Isometric View. 3.4.10 Treat piles visible above ground the same as columns. 3.4.11 Joints: Locate the local origin for joints at the end of the joint closest to the deck origin in the “Y” direction. 3.4.12 Bearings: Bearings are not described via coordinates and thus do not need a local element origin. 3.4.13 Use a temporary marker to mark typical local origins for each type of element. Take photos of each type of local origin using FLD-DC-PH-002, Photographing for Documentation Purposes, and create a photo log. 3.5 Use sketches as needed to document locations of local origins and to supplement the photographs. 6.1 For the elements identified in FLD-OP-SC-002, Structure Segmentation and Element Identification System, it is most efficient for each individual element to have a local origin from which measurements to the location of defects can be made. This protocol provides guidance on locating that origin and using the local origin to measure the location of defects. 6.2 The local origin on each individual element has the local coordinates x = 0, y = 0, and z = 0. 6.3 If the theoretical location of the local origin is missing due to loss of section at the local origin’s point on the element, use straight edges to estimate its location for measurement to nearby defects. 6.4.1 A pier cap has top and bottom surfaces, two surfaces at opposite ends of the cap as well as the two opposite sides of the cap. 6.4.2 A steel I-girder has the two opposing surfaces of the web as well as the bottom surface of the top flange and the top and bottom surfaces of the bottom flange. 6.4.3 A concrete I-girder has the two opposing surfaces of the web as well as the bottom surface of the beam and the sloped faces of the beam flanges. 6.5.1 For a defect on the end face of the square end pier cap, the y-coordinate will be either 0 for the end of the cap nearest the local origin or a value equal to the length of the pier cap for the end of the cap farthest from the local origin. 6.5.2 For a defect on the long face of the cap, the x-coordinate will be either 0 for the face of the cap nearest the local origin or a value equal to the width of the pier cap for the face of the cap farthest from the local origin. 6.5.3 For a defect on the top surface of the cap, the z-coordinate will always be a value equal to the depth of the pier cap; for a defect on the underside of the cap, the z-coordinate will always be 0. 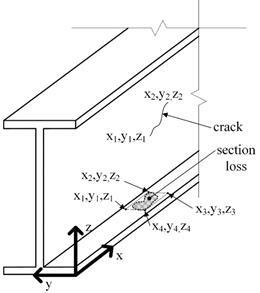 6.6.1 If the defect being documented is a crack located on the face of the web of a girder, the crack location is defined by the x and z coordinates of the beginning and end of the crack, plus a constant value for y. 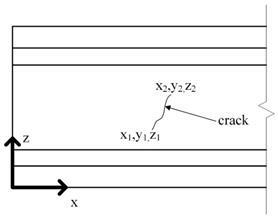 In this example, the orientation of the crack would be the angle between a straight line from the beginning to the end of the crack and the x-axis. 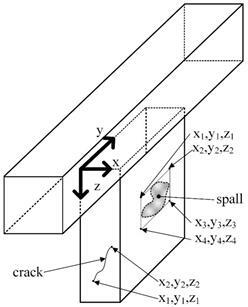 6.6.2 If the defect being documented is impact damage on the bottom flange of a steel girder, the location of the impact damage is defined by the x-coordinates of the beginning and end of the affected length of the flange. 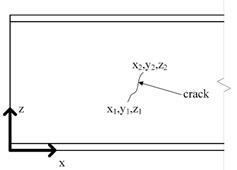 6.7 The location of an area defect (such as an irregular spall) is documented by determining the coordinates of the four corners of a rectangle bordering the largest dimensions of the defect on the element. 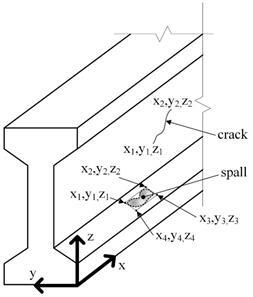 6.8.1 To locate a linear defect (such as a crack) on the face of a round column, measure and record the z-coordinates and the circumferential measurement, “c,” at the beginning and end of a crack. 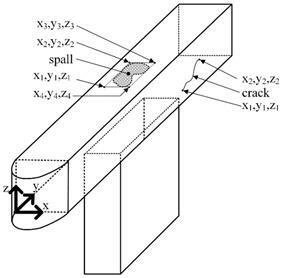 6.8.2 To locate an irregular defect (such as a spall) on the face of a round column, measure and record the z-coordinates and the circumferential measurement, “c,” of the four corners of a rectangle bordering the largest dimensions of the defect on the column.